Jesús Díaz: Great mix and cool retro look. Are these regular motherboards you are using? Richard DaLuz: The systems inside the Super Genintari aren't anything you have to special-order. They're all the same old systems myself and many others grew up with through the '80s/'90s and regularly find floating around at garage sales to this day. I used the beloved old gray and white "toaster" NES board, a model 3 Sega Genesis, the smaller redesigned SNES and an Atari Flashback 2 for the 2600 portion, since it's much smaller and easier to work with than retrofitting the original board from the '70s. It's still official reworked Atari hardware and completely compatible as far as I know, so all is well. The basic rule was that if any of the systems couldn't play ANY game I threw at it, it was out. I tend to avoid the much smaller "pirate/clone" systems for this reason. JD: You didn't have to do any modifications to the boards to make them fit? RD: The only board I really had to do any "major" modification to was the NES, and that was just a simple A/V amplifier mod using parts that can easily be found at any Radioshack for pennies. Other than that, just a lot of tedious rewiring and soldering to relocate the cartridge connectors. JD: You have any background in electronics? RD: Believe it or not, very little! I took one class way back in high school that basically just taught me how to operate a soldering iron without burning myself and/or others. (I still can't even tell you what the hell Ohm's Law is without Googling it.) Other than that I have no official training. Just a lot of dinking around by myself, finding out what works and what doesn't. It's an area that I've been curious about since I was a kid and still have yet to pursue professionally. This should be inspiring news to anyone else that's interested in this kind of stuff. 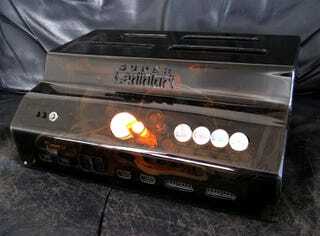 JD: What was the final bill for this wonderconsole? RD: Mmm. You'd have to shell out whatever the going rate is for the four different consoles, plus about $50 or so for the casing materials, adhesives, machine screws and whatnot. Easily a couple hundred bucks if you're starting with nothing. But that's assuming you already have access to the necessary tools you'd need. (Soldering/desoldering irons, screw drivers, clamps, wiring, etc.) I ended up spending much more than that considering how many changes I made along the way though and that's something you have to consider when you're doing this kind of work. Nothing ever goes according to plan and the ole' wallet ends up taking the hit. JD: And for how long have you been working on it? RD: As far as what it's cost me in time... my God, I don't even know where to begin. I've been working on this damn thing on and off since early 2002! Granted I've taken many "sanity breaks" for several months at a time during the process and changed many things along the way, but that's still a long freakin' time. It's hard to come up with a figure for the time I've put into this thing, but know this... I wouldn't allow myself to part with it for less that a few thousand. I'm pretty sure this thing literally has my blood in it somewhere! According to Richard, the system is very easy to hook up. Just one A/V cable is needed and you don't have to depend on any external transformer: he put all the necessary power in the case itself. Playing with it is as easy as the video shows: just plug in, put the cartridges in, turn the Super Genintari on, and enjoy.